The four assistants who had a hand in the discovery? Suzanna Pratt, Patrick Conry, Matt Wieck, and Wesley Wood—all undergraduates in Notre Dame’s College of Arts and Letters. As the sun dipped below the Ionian Sea on the last day of this summer’s visit to the site, a sense of urgency settled in with the darkness. 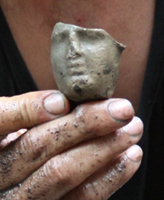 Their hard work had yielded a prize: Excavation team members recovered a palm-sized goddess head, later classified as an ancient votive offering. The find, a depiction of a Greek goddess like Athena or Aphrodite, lay 16 feet below the surface of present-day Butrint on what once was a rocky shoreline. Butrint, recognized by UNESCO as a World Heritage Site in 1992, has yielded historical riches dating as far back as the 7th century B.C. 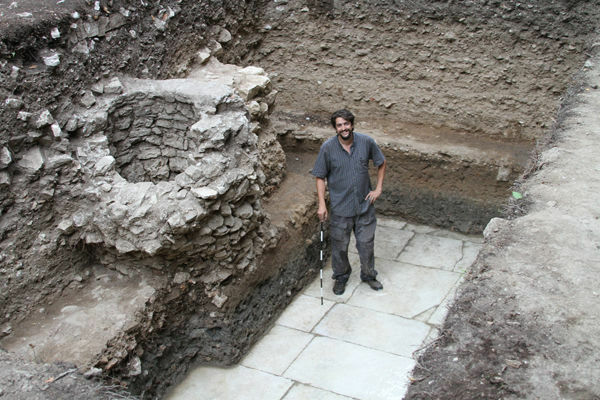 In successive layers, archaeologists have found dramatic evidence of a Greek healing sanctuary of Asclepius, a Roman trading port, a medieval settlement, a Renaissance-era Venetian castle, and more. “Whenever finds turned up, it was fascinating to realize that we were digging in a place where these people actually lived,” says junior Suzanna Pratt, a Seattle-area native majoring in anthropology and peace studies. Appointed the finds manager at Butrint, Pratt marveled at the proximity of two worlds while handling and classifying objects such the goddess head or a perfectly intact—and useable—bronze spoon. Once, she examined a ceramic sculpture that still displayed its maker’s fingerprints. The connection spanned centuries, she says, but felt intimate. Exhilarated by her experiences, Pratt says she plans to write a senior thesis related to her work on the project and is now considering a career as an archeologist. She also continues to study the Albanian language and may even pursue a Peace Corps appointment to Albania after graduation. While Pratt says she feels privileged to have worked with about 20 archaeologists, art historians, and other experts in the field as a student, she’s especially grateful to Hernández. 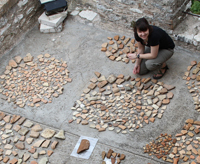 The Department of Classics professor, who has spent nine years working at the site, has an extensive knowledge of excavation methods and urban stratigraphy and is fluent in Albanian, among other languages. He is also currently project director and principle investigator at Butrint. 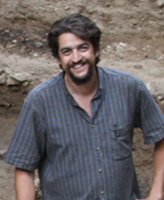 Co-directors of the project, funded by the University of Notre Dame, the American Philosophical Society, and the Butrint Foundation, are Richard Hodges, director of the University of Pennsylvania Museum of Archaeology and Anthropology, and Dhimiter Condi, of the Albanian Institute of Archaeology. Funding from Notre Dame’s Office of the Vice President for Research and the College’s Institute for Scholarship in the Liberal Arts helped underwrite Hernández’ research—and covered all student expenses including transportation. When staffing his excavation team, Hernández says he looks for undergraduates who can handle responsibility. “I consider the undergraduates as team members and certainly not newcomers assigned to minor jobs,” he says. “They’ll need to be mature and work well in a team environment, so I look for merit, intellectual curiosity, and performance alongside personal drive, motivation, and interest. Classics major Wesley Wood is another example of the motivated and capable students Hernández invites to Albania. Wood, who is a Crown Point, Ind., native, had never travelled internationally before Butrint. Now, he says, he considers archaeology a potential career choice and practices his Albanian language skills on campus with Notre Dame friends. 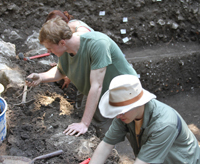 While in Albania, Wood first literally “worked in the trenches” of the excavation and later helped catalogue the site’s “bulk” finds, including pottery, animal and human bones, glass, and metals. Wood says the joy of discovery propelled him through his four weeks in Albania with lightning quickness. 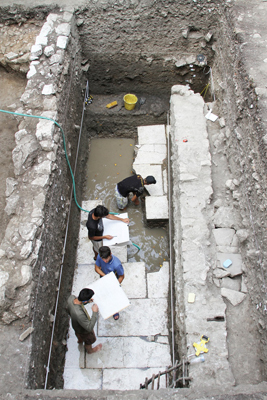 When the excavation team made its first major discovery—the immense pavement slabs of a perfectly-preserved Roman forum—he says he knew he was hooked. “When you walk on a forum, there’s a connection,” he says. All photos courtesy of David Hernández. Originally published by Mark Shuman at al.nd.edu on October 12, 2011.